It was a very old hydrant -- but the real problem came from another city bureau's work! At the corner of S.E. Cesar E Chavez Boulevard (formerly 39th Avenue) and Flavel Drive, the Portland Water Bureau presented the Eastmoreland neighborhood with a brand new water hydrant. It's installed near Holy Family Catholic Church. On the sunny-but-cold day of Saturday, March 2, PWB replaced an 1898 fire hydrant. "We're not sure exactly when it was installed, but the date stamped on the hydrant is '1898',' the Water Bureau supervisor told THE BEE. 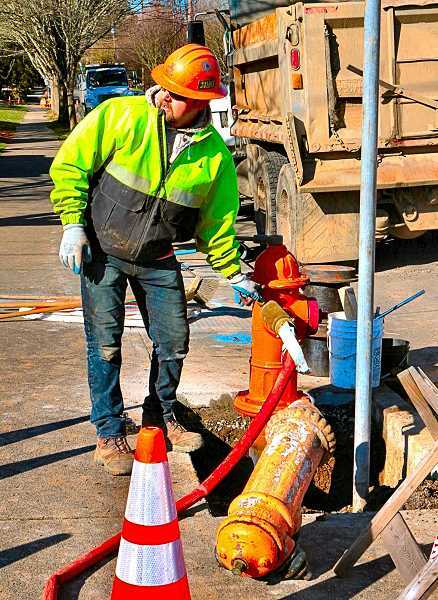 The new hydrant is placed about three feet west of the previous location – because the City of Portland Water Bureau's hydrant's main outlet had been blocked by – a new City of Portland Bureau of Transpiration steel signpost! While installing the updated hydrant, the supervisor pointed out they were also installing a new "isolating gate" (valve) in the main line, allowing water to be turned off at that point, instead having to shut down a wider area of water service in the event of an emergency.